What are you listening to while you're MoFoin' it? Right now, I'm listening to a Black Crowes album; Three Snakes and One Charm. "I said hey Blackberry, look at my bumble bee." Right now: nothing. But if I were listening to music, it'd be REMOVED SUPER EMBARRASSING SONG A DECADE LATER, and, most likely, Pearl Jam's Jeremy or Blues Traveler's Hook. Last edited by Yoda; 03-04-14 at 01:31 PM. No wise man has the power to reason away..."
Anybody ever see Tommy Davidson's stand-up routine where he does a pitch-perfect Michael McDonald impression? Great stuff. EDIT I love the Doobies, Michael McDonald has a great voice. I ain't gettin' in no fryer! I'm usually listening to whatever I have in my winamp playlist, or "watching" a movie. I put watching in quotations because I'm usually glancing back and fourth unless it's a movie I haven't seen. You know how we have the 'mood' thing? And the song/album title in italics. It'd have to be changed a bit for it to work (what with songs not taking too long and the need, therefore to always change the title), but it'd be pretty cool, no? Well, I've got burned CDs and playlists and such, so I don't have to go switchin' much. I wish more albums were of that variety, though. I've only got a handful I can play straight through without feeling the intense urge to skip ahead at least once or twice. EDIT: indeed. In fact, as Sadie will surely confirm, I had such an idea a few months back...but never acted on it. Think there'd be enough interest? my text is bold......and d's look like b's......hence i thought holden said he loves the Boobie Bros.
.......hunh, ......sades seems to like them too, i should check them out. me? i'm ray charles all the way tonight.......and i've been james tayloring it a lot lately. There'd be enough interest, yes. .......and i've been james tayloring it a lot lately. right now i'm listening to boards of canada. Right now it's the Gourds' Dem's Good Beeble. -from "Trampled By The Sun"
You were a demon and a lawyer? Wow. Insert joke here." " I know it will hurt (I know it will hurt) I know it will break your heart the way things are...and the way they've been; and the way they've always been." I'm listening to "Jesus, etc." by Wilco right now. 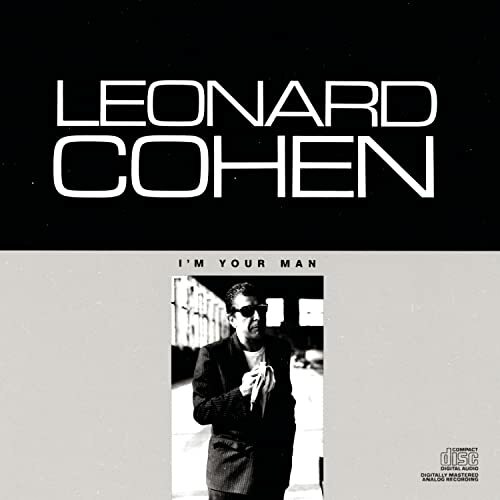 I've got Leonard Cohen's I'm Your Man playin' right now. In fact, this is my fourth tme through, I've just been starting it over once it finishes. my two favs are American beauty and Duel of the Fates.... Requiem, unbreakable are up there too. "Who comes at 12:00 on a Sunday night to rent Butch Cassady and the Sundance Kid?" Not kidding here. Just downloaded it today. Everything is destined to reappear as simulation. Now I've switched to Art Pepper's So In Love. Damn, I love his take on Monk's "Straight, No Chaser'.